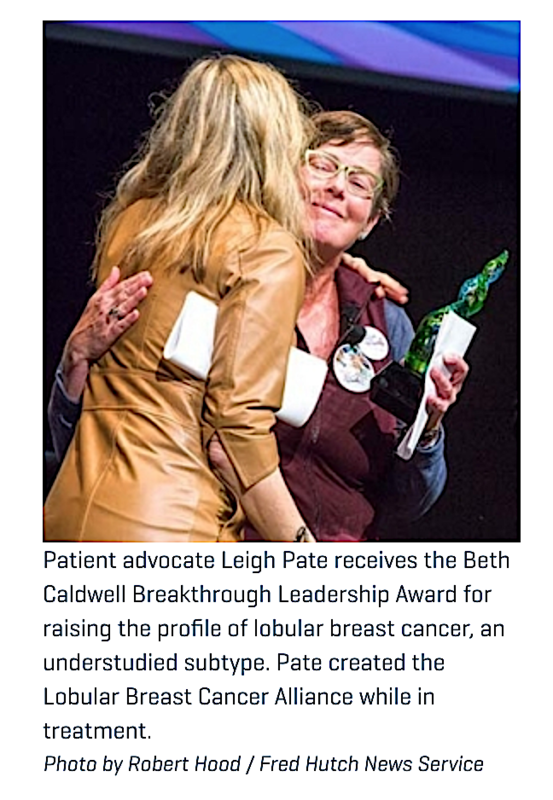 Leigh Pate of Seattle, WA received the Beth Caldwell Leadership and Advocacy Breakthrough Award. The award was presented at the Northwest Metastatic Breast Cancer Conference fall 2018. “This leadership award is given to a game-changing force in metastatic breast cancer advocacy nationally, in honor of a game-changing advocate for metastatic breast cancer.” said conference co-chair Lynda Weatherby. 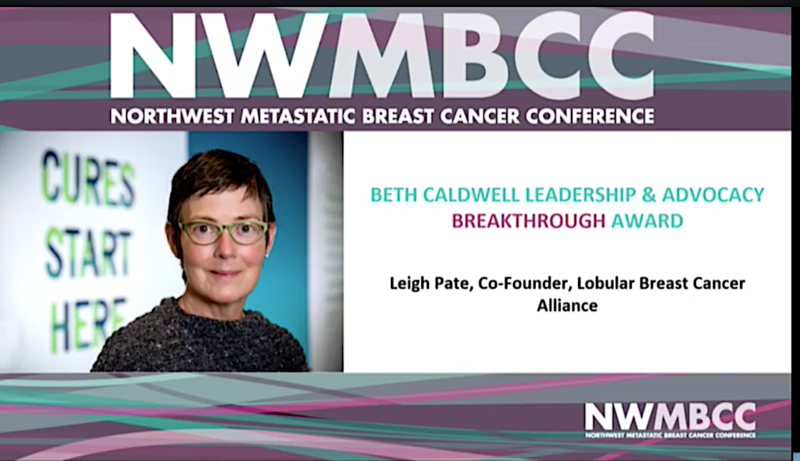 Beth Caldwell co-founded the NW Metastatic Breast Cancer Conference and she was nationally recognized as a leader in the Metastatic Breast Cancer advocacy community. Caldwell was the first recipient of the award, which was accepted on her behalf by her husband after her death. Teri Pollastro, NWMBCC conference co-chair, presented the award, noting that Pate led the first advocacy efforts to bring a national leading speaker to the conference, created the first and only online resource for lobular patients to learn about their disease and led the first advocacy efforts to push for more research in to ILC. “Leigh has worked so hard to elevate the profile of lobular disease outside the little corner of breast cancer land where it lived, and her work is benefiting lobular patients everywhere,” Pollastro said. LBCA invites everyone living with lobular breast disease and everyone working to treat patients and research better treatments to join us so we can all work together to advance research and bring lobular breast cancer out of the shadows. The 2018 Northwest Metastatic Breast Cancer Conference is hosted by Susan G. Komen Puget Sound. It is livestreamed and recorded, and included sessions on lobular breast cancer.